It has been 5 months since the last post, and a lot has happened. Before I fill you in on the results of the stool test, what we did as a result, and the results, let me briefly review our journey with my son’s eczema for those who don’t have time to read all the posts from the beginning. 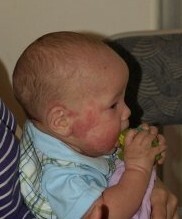 He developed eczema at 1 month old. It was diagnosed around 3 months, and we tried to avoid all steroids, even hydrocortisone. But he was a really miserable little baby. We tried everything, even goat’s milk formula (turned out all dairy is off limits, not just cow), and I restricted my diet to the point of frustration until he was weaned at 12 months. We added Triamcinalon, a medium-level steroid around 18 months just to control the symptoms, and not long after that we started to see a naturopath who was recommended by his pediatrician. When I ended the last post, we were waiting on the results of a stool test. The results came late in February. For insurance reasons, they were sent to his pediatrician, and we received a copy in the mail as well, which we shared with the naturopath at the next visit. It just so happened that my son got a bad cold that turned into bronchitis just after the test results arrived, and before the scheduled naturopath’s visit–which I think got delayed for some reason, probably the cold. My husband took him (since I think I was also feeling under the weather at the time), and the pediatrician went over the results of the stool test. In a nutshell, he had a gut full of pathogenic bacteria. Which confirmed his suspicion that the source of the eczema was in his gut. Let me explain a little. You may have heard about beneficial bacteria in the gut. They help to digest food and do other things. They coat the surface of the intestines. If they are killed off and yeast (such as candida) is present, the yeast will multiply to fill in the gaps. On the other hand, they can be killed off by pathogenic bacteria–and they had certainly been doing that, because showed almost no beneficial bacteria in the test at all, in spite of all the probiotics he had taken for the past year. There were also neutral bacteria, neither beneficial nor harmful, but taking the place of the good bacteria. The doctor, of course, prescribed antibiotics to treat the bronchitis. Normally I would have hesitated, but when I realized that some of the pathogenic bacteria was susceptible to the antibiotic, I figured this would be a way of killing two birds with one stone! Not long after we met with the naturopath. He reviewed the test results and explained them to me. He asked us to up the Infaskin probiotics that had already proved to help him so much, to counteract the antibiotics. I think he also upped the Vitamin D from 1,000 IU to 2,000, because he felt Manny could be getting a little more of that. On a side note, the results for the parasite test came in later, and they were negative. He also showed a little yeast, but it didn’t seem to be a significant problem. Especially since he eats mostly gluten-free grains and I sweeten his home-made rice or teff milk with stevia, so his sources of sugars are quite limited. Just around the time the antibiotic treatment finished, a tree fell on our house. It was quite a disaster, and we’re still not back in our home almost 5 months later. That was March 15th. We spent the next 10 days living with some friends in their house nearby, and during that time, we used the Triamcinalon for the last time. We haven’t used it since. Over the months since then, I have watched my son’s skin steadily improve. He went from breaking out in small patches most everywhere to breaking out only on his tummy, face, neck, groin, and folds of elbows and knees. And in the last month I haven’t noticed anything on his tummy. I ran out of the prescription 2.5% hydrocortisone and bought some 1% at the drug store recently. I remember when we would go through a 2 oz. tube in a week, but now I think that tube will last us a couple of months–and I don’t use it every day, at least, not on the same spot two days in a row. He scratches less. He’s a happy little 2-year-old when he’s not having a melt-down. And he’s steadily improving. At the last visit with the naturopath–back in May, I think–he didn’t change anything about his treatment and scheduled his next appointment for September, saying to only call if he got worse or stopped improving. Which he hasn’t. So that’s the latest. He’s not cured, but he’s on the way. It’s going to be a while before we start trying things we have eliminated from his diet, though we occasionally try new things (like parsnips–he likes them and they don’t cause a reaction, yay!). So now it’s your turn. Share this story with others or share your story. What have you done that has worked? What didn’t work? Every case is unique, and what worked for Manny might not work for the next reader. But what worked for you might. If you would like to share your story here as a post instead of just in a comment, let me know! This site is here to tell my story, as well as provide a place where parents of children with eczema can share and find strength to deal with the problems they face. 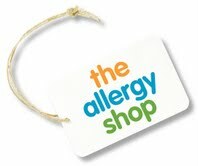 If you know of a product that has helped you or someone you know with eczema, please do not post about it in the comments, but rather click on the contact page and send me the information directly about it. Thank you! I Think the Eczema Is Finally Going Away! Thinking of Shopping on Amazon? Now you can support this blog when you buy the things you need. Just use this link to get to Amazon and we will get a small percentage of your purchase. Thank you! Like This Blog? Please Share! Got a Question? Wanna Talk? My Baby Has Eczema is © 2011 by Lisa Reynoso and is powered by WordPress using the Simplicity theme. Subscribe to this blog (RSS) or to the Comments (RSS).